Half off clothing at Thrift Town came through for me. 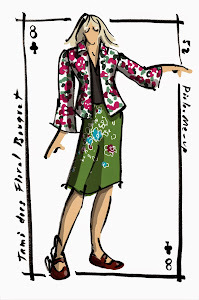 For under $10, I added an Eddie Bauer cornflower blue short-sleeved collared shirt, a Gap Body t-shirt, and a Liz Claiborne black and white skirt. 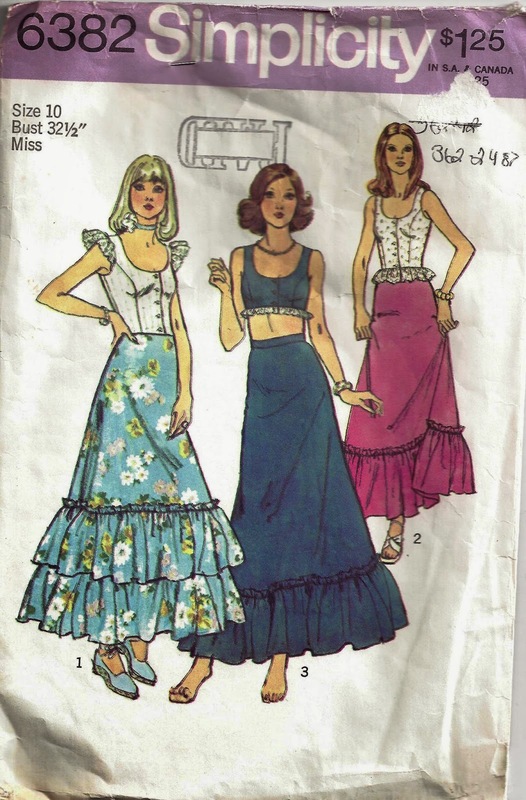 On the topic of blue - these maxis from 1974 are worth a share on this post. Since midriffs seem to be "in" the gal pictured in the middle is right on trend. I had seen the idea of repurposing old luggage for storage and was finally able to locate a piece just for that purpose. At $4.50, this suitcase, while horrible for travel, is perfect for keeping linens and blankets. The suitcase interior was clean and it was cheaper than the clear Rubbermaid containers. I throw in a cedar block for good measure. One of my keeper items in this case was a large knitted pink cape (not pictured) that I couldn't bear to part with. 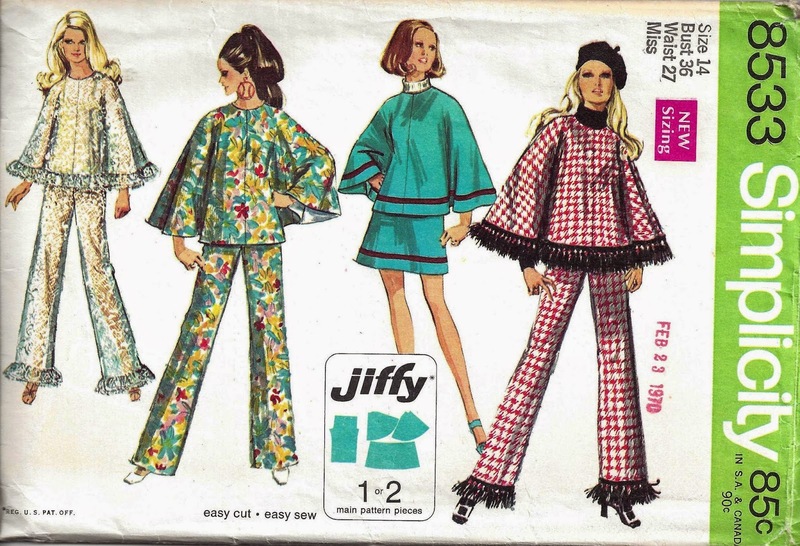 This 1969 pattern highlights a cape similar to the one I packed away. I took a badly needed bloggy break. I had been re-thinking my blog, of which I so love, stripping it back down to thrift shop finds, writing challenges and my labor of love - Countdown to Kitschmas in December. I felt there was just toooo much Tami. Even though my page views go cray cray on my fashion posts, I was starting to feel uncomfortable about that much internet exposure. So dear audience, I will share those things that delight me (and hopefully you too). 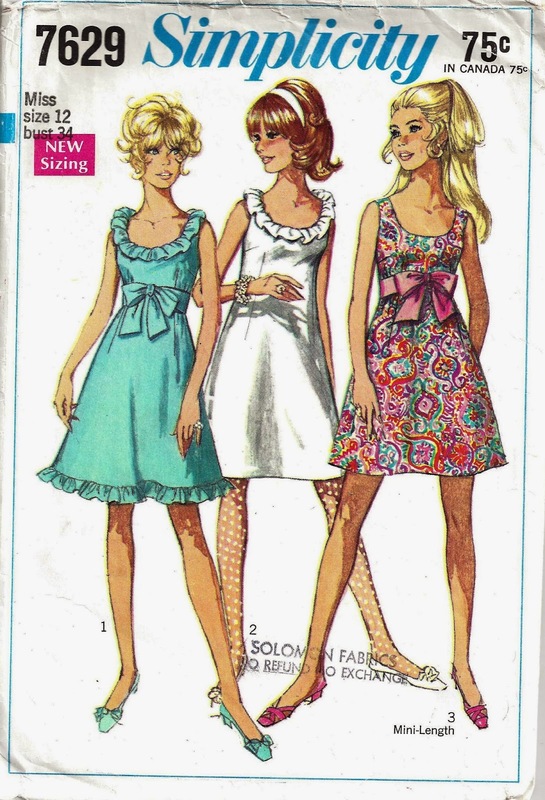 I have been on the hunt for patterns from the 60s and 70s. I must admit the graphics and hairstyles are my fav part of collecting these items. This pattern from 1968 is one of ten I found thrifting. Ran into a rummage sale - those are the absolute BEST for pricing. Some thrift shops are pricing way too high, especially for collectible books. 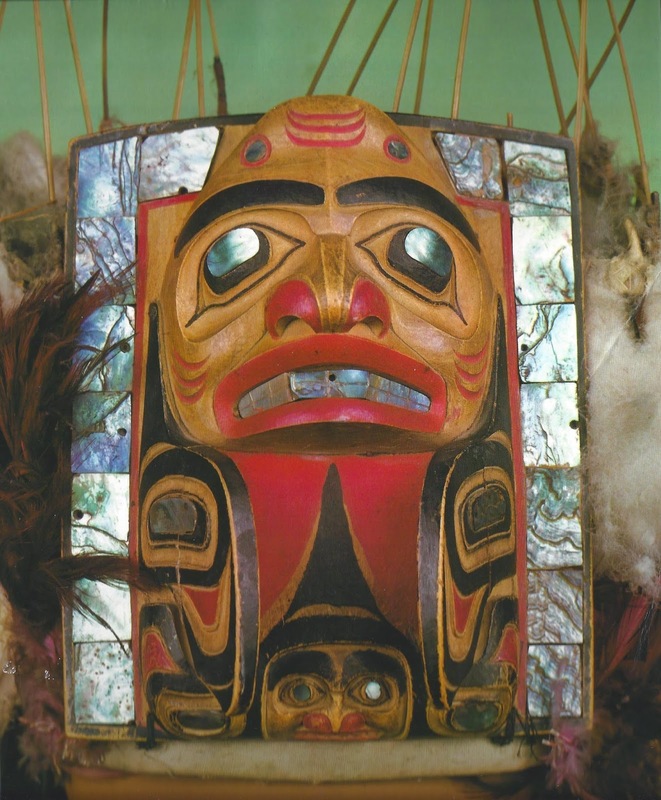 This image is from the first plate of the 1965 publication American Indian Art by Norman Feder ($1.00 at the sale). This tome could double as a door stop - it is that heavy. After I give it a look-through and capture the image plates on scan, I will place it for sale on EBay. My hospice thrift shopping resulted in a panoply of pink, a Bernie of New York scarf, Talbots pink T-shirt (NWT), a three-strand fresh water pearl necklace, a couple of CDs (Disco YAY!) and the 1969 publication of Modern Cake Decorating. And since I punted on Vanessa's Mad Tea Party earlier this month (sorry sweetness), I am going to end the post with the image of Madame Alexander and Diddley dog lost in the Brussels forest.